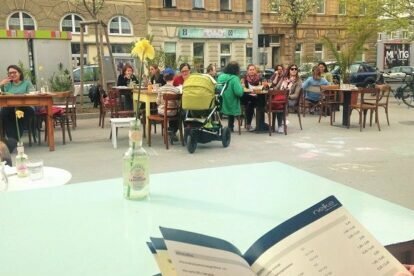 Why sit inside – with old ladies and tourists in coffee houses – on a sunny day when there is a cute outdoor café on a big market square in a more unknown part of Vienna!?! Bad weather? If you don’t mind a tiny and smoky indoor place: go inside and enjoy, it is kind of cosy as well! You find the coffee shop Nelke, with big outdoor area, in a small former food stall (number 38-39) on the Volkertmarket in the 20th district, which is still pretty non-touristy despite its central location. This area used to be quite rough but is starting to become slightly posher and gentrified. With all its ups and downs… But it is here on this very market where you can see: Turkish kids playing football, construction workers having a Döner during their midday break, old men chatting and women buying bread before hopping on the bus – which brings you to the end station of the famous Karl Marx Hof. Get yourself a good coffee, watch and enjoy! The food is nothing fancy (salad, pita etc), but I like that they serve breakfast all day with homemade jam and freshly pressed juice. And the homemade lemonade is great! Due to market laws they are only allowed to open on weekdays and until 22:00. But the nicest time to visit I reckon is anyway on a sunny morning or afternoon!